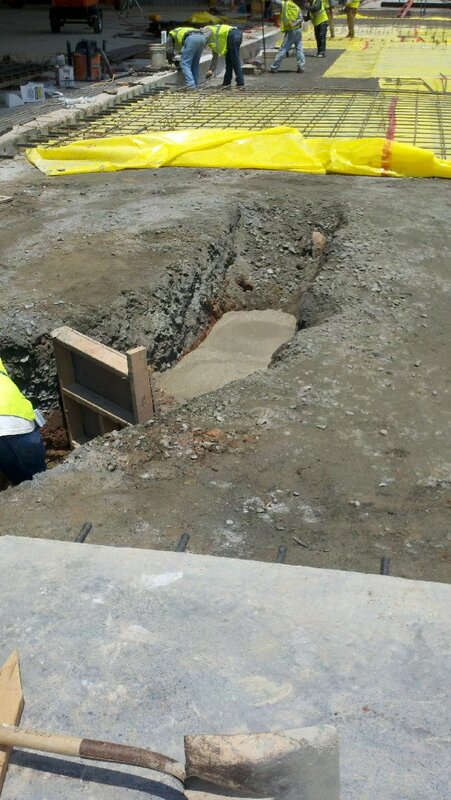 Void Fill Grouting is typically called for when the roof of a void collapses, or a sink hole or depression forms producing deformation of the ground surface or when pre-construction site testing uncovers such potential defects. The gradual deterioration of the void, usually over a period of years, most often appears as cone shaped depression, or hole at the surface which can result in damage to buildings, utilities and roads. Voids can form under a variety of conditions both natural and man made. Trash and rubbish buried during construction will produce a void as it decomposes. If the trash pit is located under a concrete slab, building footer or foundation structural damage will often result form the subsidence. Sanitary and storm sewer pipes breaking will allow fill materials to carried away producing underground voids. Damage to structures from void formation may be minimal to severe. These damages may include cracking in foundation walls and floor slabs, cracking of brick veneer, vertical displacement of the structure with severe tilting an inability to properly open and close doors and windows. Under extreme instances, complete structural failures can occur. Filling of the void is conducted in one of several ways depending upon a variety of factors including location of the water table, the size of the cavity, its proximity to the surface and location in relation to structures. One common and simple technique used to stabilize the subsurface and prevent subsidence is using cement based Portland cement or chemical grouts and foams to fill the cavity below. This method employs the use of pneumatic or drilling equipment to install pipes that connect the surface to the void below. The pipes act as conduits to the subsurface void allowing grout to be installed. Grout pipes can be from 1-¼ inches up to 8 inches in diameter, depending on grout mixture and placement volume desired. Once the grout pipe or pipes are in place it is a simple matter to fill the cavity. With the use of shut off valves and pressure gauges it is possible to determine when the cavity has been filled. Once the cavity has been filed the pumps and valves are turned off and the grout allowed to cure. Gibson's Pressure Grouting Service specializes in filling voids. Our engineers and geologists can determine the best and most cost effective solution to rectify nearly any situation.